As part of the Simon Cumbers Media Fund, Paul Fallon travelled to Bangladesh to investigate how children are trying to escape from a modern form of slavery. DHAKA IN BANGLADESH is one of the fastest growing cities in the world, with its current population standing at over 17 million people and the UN predicting that figure will rise to 20 million by 2025. Dhaka is also the fourth least-liveable city in the world according to The Economist’s Intelligence Unit which rated it just ahead of Lagos, Tripoli and Damascus. A large portion of Dhaka’s city dwellers are living in slums and do not have access to basic rights, such as fresh water and sanitation, education and health services. UNICEF estimates that over 43% of the population in Bangladesh is currently living below the international poverty line. The number of slums across the country is staggeringly high: around 14,000, of which more than 3,000 are in Dhaka city. Many of Dhaka’s poor have migrated to the capital from rural regions in search of work and face discrimination on many fronts, from lack of social security to access to health services. According to the International Labour Organisation, nearly 3.5 million children in Bangladesh between the ages of five and fifteen are actively working, with a staggering 1.2 million of these engaged in life threatening and hazardous work. Over half of the children working in Dhaka are doing so in the readymade garments sector and their work is an economic necessity for their families’ survival. 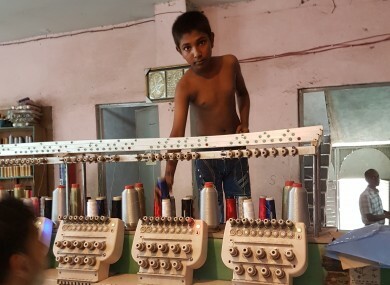 Some child labour is visible in Dhaka with young children selling goods to motorists or working at public stalls, but most child labour is hidden from view in the many thousands of factories around the city and in domestic work, making implementation of national labour laws nearly impossible. The UN Committee on the Rights of the Child has expressed concern that many Bangladeshi children continue to work in five of the worst forms of child labour, namely tobacco factories, battery recharging, road transport, welding and auto workshops. A persistent cycle of poverty causes families in the slums to send their children to work, often in hazardous and low-wage jobs, such as brick-chipping, construction and waste-picking. Children are paid less than adults with most working up to twelve hours a day. Full-time work frequently prevents children from attending school, trapping them into what is in many cases amounts to modern slavery. In the beginning I wanted to help women who had no rights, those experiencing domestic violence. From there we have grown to tackle other issues and now we provide a range of supports to underprivileged women and children in fifteen slums with over 50 staff who assist me in doing this. Sohay focuses on raising awareness in slum communities about human rights and provides support through education and skills development programmes. I met with a group of young people who managed to exit the cycle of bonded labour to receive an education with Sohay. They had begun working in factories at age ten, 12 hour shifts, six days each week. Now, as teenagers, Sohay has been training them in IT skills and tailoring, giving them skill sets that will ensure they gain employment in good working conditions as adults in order to break the cycle of poverty they have been born into. They tell me their stories about working long hours, in dangerous conditions. Suborno was a rubber factory worker before getting involved with Sohay. She used to work over 60 hours a week in dangerous conditions at the age of ten, in a polluted and hazardous environment. “My father is a rickshaw puller and my mother a factory worker, our house needed extra income so I began working in a local factory. It is very hard work, I had difficulties in breathing because of the dust in the factory. “If I became injured by a machine or chemicals I couldn’t see a doctor as there was no doctor. The drinking water was not clean and I was sick all the time. I had to carry leather around for cutting and making shoes. Suborno’s life changed after meeting with a Sohay staff member who offered her an opportunity to get an education. It meant a reduction in their current income for her family, but the long term goal was clear: life. With Sohay children have been given a chance to exit this draconian cycle of hardship, training them in many fields from computers to literacy and numeracy. The boys I meet are learning how to fix mobile phones. Some of them have taken up work with local phone shops, the girls have been learning how to sew and are taking up employment with local tailors. Last year we helped 1,540 children to leave hazardous work and 2,125 vulnerable children – those in danger of entering work – into school, but there are some children that you cannot reach, because their income is part of their livelihood, they have come here from remote villages, sent to work as there is no work in the villages, but they are locked into bonded labour, factory owners give them food and shelter in exchange for work, without this they would not survive, we try and negotiate with the factory owners to let them out for an hour or two each day so that we can give them a basic education in the hope that one day they can break the cycle. Sohay’s’ diversionary programmes are life altering for these women and children, offering them a strategy to experience a different life from that of bonded labour. This huge societal challenge is all being done from its small facilities dotted throughout the slums. Email “Modern Slavery: How children in Dhaka are trying to escape from 12-hour workdays ”. Feedback on “Modern Slavery: How children in Dhaka are trying to escape from 12-hour workdays ”.